L. Francis Herreshoff (1890-1972) was a naval architect, author, and editor who had a profound impact on yacht design in the mid-twentieth century. Francis, as he was known, was the son of the famous “Wizard of Bristol,” Nathanael G. Herreshoff, probably the most recognized naval architect of his time. As one might expect from a son who grows up in the shadow of a legend and then enters the same profession, Herreshoff labored under the mantel of great expectations. Maritime author and publisher Roger Taylor was commissioned by Mystic Seaport to write this biography and was given unfettered access to Herreshoff’s papers and plans, which are held by the museum. Taylor’s journey began when he met Herreshoff as a student at Milton Academy in 1948. Having admired his designs over the years, he set out to explain who the man was and how he worked. 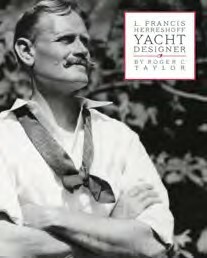 Through people’s correspondence with Herreshoff and interviews with those who knew him, Taylor describes a man of artistic and technical genius, who was shy, generous, and suffered from inward pain. Herreshoff had a difficult relationship with his father, which most likely affected how he related to people throughout his life. But L. Francis Herreshoff was also driven in his work. The narrative follows him from his service in the Navy to his time working for Starling Burgess—who greatly influenced the young designer—to his striking out on his own. Herreshoff is depicted as confident in his work and one not disposed to appreciate criticism. He was also at times unconventional and open to innovation. His willingness to try new things was matched by his ability to write about it, as his books and commentary indicate. As with any artist, and Herreshoff was definitely an artist as details from his plans attest, one cannot truly understand the individual without looking at his work, and that is where this book shines. Taylor provides detailed descriptions of Herreshoff’s designs, with copious illustrations and 166 boat plans. There are nine foldout plans, including Istalena and Live Yankee. Taylor has been working on this biography for nearly 20 years, and the thoroughness shows. This is the first of two volumes and follows the man’s life up to 1930, when he designed the unorthodox J-Class yacht Whirlwind for the America’s Cup. For the L. Francis Herrehoff buff and casual reader alike, L. Francis Herreshoff: Yacht Designer is a detailed, visual peek into the life and work of one of the most influential naval architects of his time. Herreshoff has not attained the prominence of John Alden or Olin Stephens. This book makes the argument that perhaps he should. Larry Kelly is the manager of the Maritime Bookstore at Mystic Seaport in Mystic, CT.